Knitting and crocheting are wonderful pastimes. Whichever one you prefer, there are a number of beautiful clothing pieces that you can make for yourself or someone special. If you have a few hours, you can easily DIY yourself a new sweater and I’ve got a collection of 30 patterns that you can use to do so. All of these sweaters are easy to make depending on your skill level. None of them are difficult even for beginners. If you’ve ever wanted to crochet or knit a sweater, now is the time. From gorgeous lacy tunics to shell stitched tank tops and virtually everything in between, you’re sure to find the right DIY sweater for every season and every occasion. You can alter many of these patterns to size, and even make some of them small enough for little girls, so you can create a mother daughter matching outfit. You also want to check out these amazing infinity scarf patterns that you can easily knit in an evening or two. From pullovers to cardigans, there is sure to be a sweater in this pattern collection that you just can’t live without. I have such a passion for sweaters – my dresser is literally full of all types of them. That didn’t stop me from making a few of these however, and I can tell you that they’re really easy patterns. 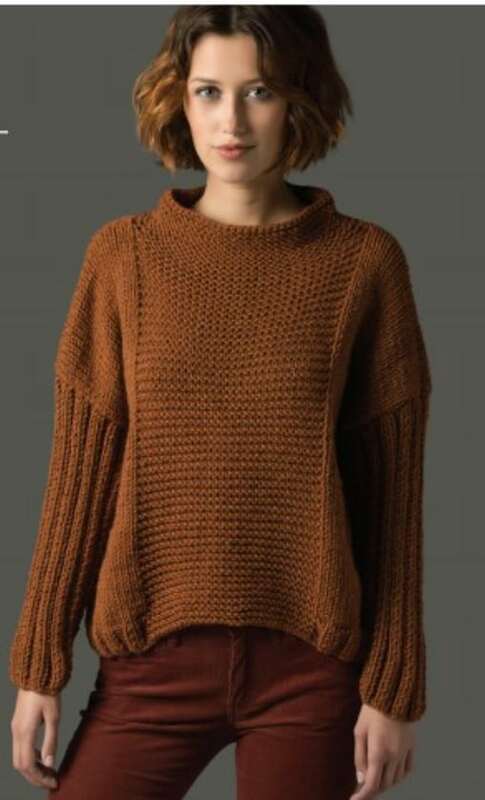 I’m not an expert at knitting or crocheting by any means and I found them really simple to follow and they create such beautiful DIY sweaters. If you’re really a fan of crocheting, you need to check out this gorgeous crocheted wedding dress that was made by the bride to be. If you’re planning a wedding this year, this is a must see pattern. Now, back to our sweaters. There are so many ways that you can create your own sweater and these patterns are so easy that you can make more than one of each and give them out as gifts. Now is a great time to get started on handmade Christmas gifts and these sweater patterns are the perfect place to start. 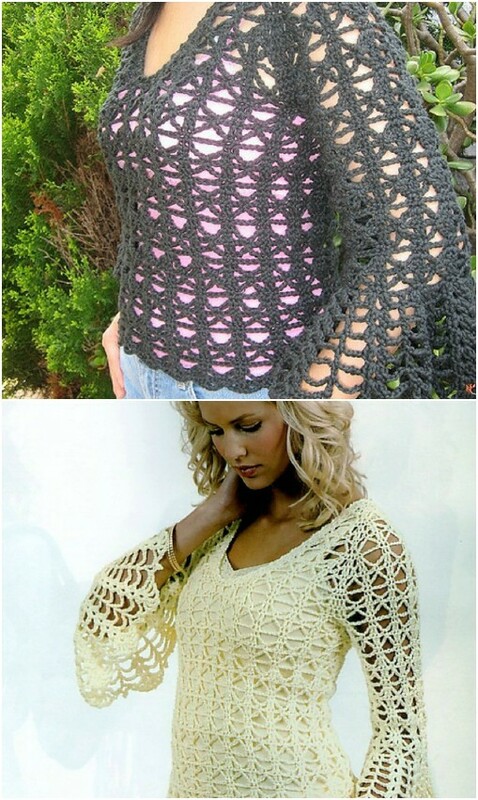 This beautiful bell sleeve pullover can be crocheted in just a few hours. The sleeves bell out at the hands, giving it a really elegant look. This is an intermediate pattern but if you know your basic crochet stitches you can easily finish it. It’s the perfect spring or summer sweater because it’s lightweight and it resembles those gorgeous sweaters you see in department stores for around $50. This one won’t cost you anywhere near that though. This gorgeous sweater is a relatively easy one to knit and it’s a lighter weight than many, so it’ great for cooler days when you don’t really need something heavy. You can wash it without hurting the shape or size and it’s so comfortable to wear. It’s a longer sweater too, so it’s perfect for pairing with leggings or skinny jeans. The pattern is really easy and as long as you know a few basic knitting stitches, you can turn this one out in just a few hours. 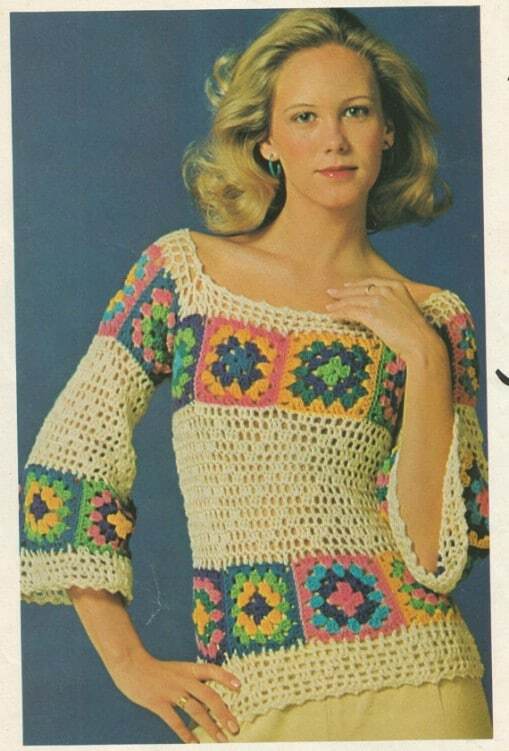 This is a great vintage pattern from Etsy for a pullover sweater that just screams 1970s. 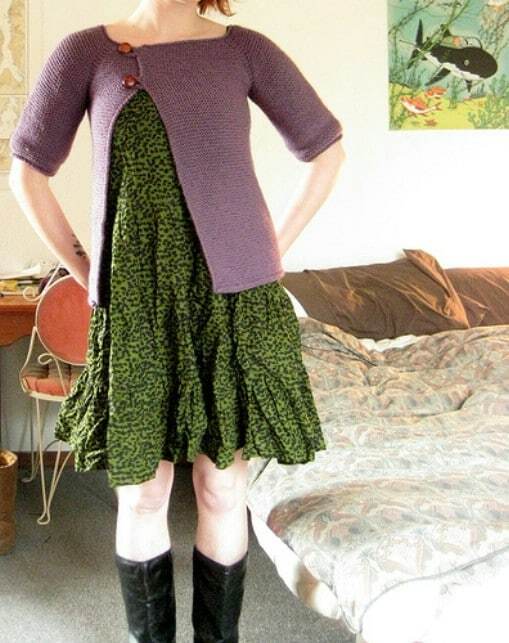 It’s an easy project that is worked with motifs across the yoke and the sleeves and waist. Don’t let the details fool you, this one is even easy for beginners. It’s so colorful and such a wonderful vintage looking sweater. It’s also relatively lightweight so it’s perfect for the upcoming spring temperatures. You can make this gorgeous sweater for less than $30. How’s that for a deal? 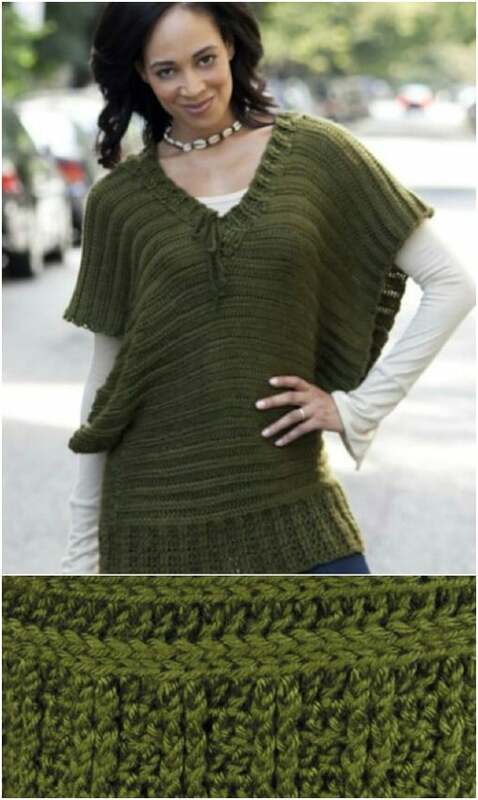 Plus, it’s a pretty easy tunic to crochet. I love the big, wide sleeves and this is a great sweater for warmer days – not too warm, though depending on the weight of yarn that you use. You could easily finish this in an afternoon and the details are just gorgeous. We all have those days when we need a nice warm sweater in the morning but by afternoon we’re wishing for short sleeves. When you need a grab sweater – something to grab as you head out the door just in case it gets cooler later – this poncho sweater is perfect. It’s a knit sweater that is long and comfortable and really easy to finish. It’s got a wide ribbed collar and uses a thermal stitch which makes it really cozy for those cooler evenings. 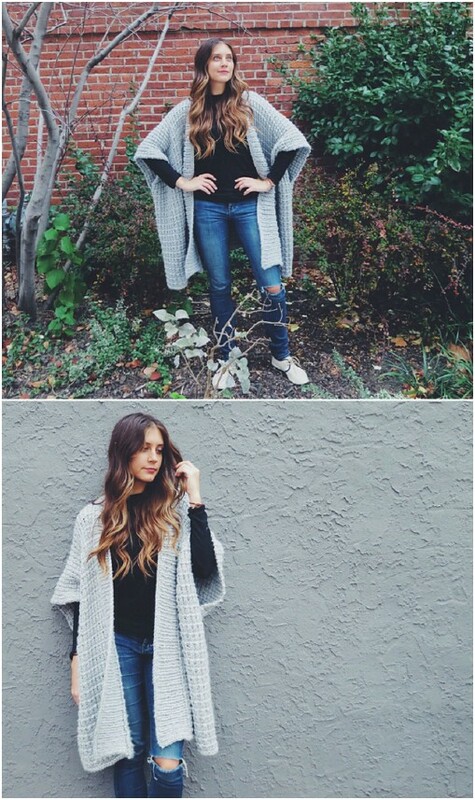 This beautiful knit coat is perfect for colder days. It takes quite a bit of yarn and is definitely not the cheapest sweater that you will ever make, but it is definitely worth the extra effort. The pattern itself is fairly easy and there are many gorgeous details. You would probably spend a couple hundred dollars buying a sweater like this in the department store but wouldn’t you much rather DIY it? This lovely cardigan can easily be knitted in a few hours. You use worsted weight yarn and size 11 needles – or whatever you need to obtain the gauge. You can adjust the pattern for sizing. Overall, it’s a pretty easy pattern to knit and it gives you a lovely open cardigan with beautiful detailing in the front. This is perfect for when you need a long sleeved sweater and want something comfortable yet elegant. This ballerina top is a beautiful sleeveless crocheted sweater. If you know basic stitches, you won’t have any trouble with this one. You can make it easier by sticking with one color but the contrasting colors look really good. You’ll use a single crochet stitch as well as double crochet, slip stitches, and clusters to create this. It’s not as complicated as it sounds. You could easily have this one done in an evening or two. This gorgeous tunic has a fanned out bottom that is simply beautiful. It’s perfect for the upcoming spring and summer seasons and would make a wonderful swimsuit cover. It resembles a baby doll top which is great and is lightweight so it’s a wonderful addition to your spring wardrobe. You could do this easily over the weekend and have time to spare for other projects too. The pattern can be done in sizes from small to XXL. Here’s another beautiful sleeveless sweater that can be crocheted in just a few hours, even by beginners. It’s a baby doll pullover that uses an easy stitch pattern and has a wonderful little eyelet peekaboo section at the top. This is a must for summer and can easily be paired with anything from jeans and shorts to skirts. You’ll love how easy this one is to make and it would be a wonderful gift for teens and adults alike. The detailing is exquisite! If you love the look of bulky sweaters then this summer sweater is perfect. You can wear it during the warmer months and it uses really simple single chain and double crochet stitches. The pattern is all straight lines. You make two rectangles for the front and back and two smaller rectangles for the sleeves. It’s a beautiful sweater that you can easily crochet in just a couple of hours. I really love the design of this knitted drape front cardigan. It gives you such a nice 1960s vibe, like something Jackie O would have worn. It’s a pretty easy knit, too. You’ll need eight inch needles and a circular to create the drape. 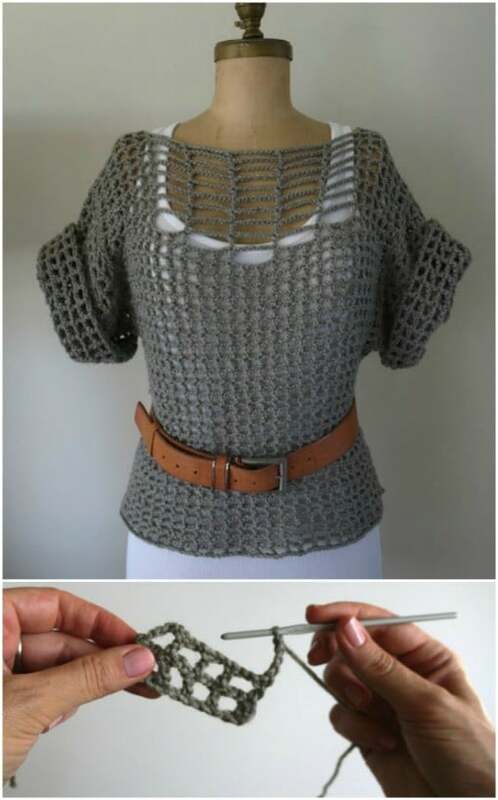 It looks like a time consuming and difficult sweater but it’s really not. You can easily finish this in a few hours and it’s short sleeved so it’s perfect for spring weather. This beautiful sweater has flower motifs and is so elegant. You actually combine knitting and crocheting to complete this so you’ll need to be a bit skilled in both arts. You don’t have to know any super fancy stitches though. It’s a pretty easy sweater to complete although it may take you a bit of time considering you have to switch between knitting and crocheting. The end result though is absolutely stunning. If you want a heavier sweater, one that hugs you like a comfy blanket, this is it. You can go with the stockinette stitch and make it really large and cozy. The sleeves are large and loose, which are really easy to create and the entire sweater just looks like something you would cozy up with on a cold winter night. The pattern itself is really easy and even beginners can master the stitches in this one. This heavy knit pullover sweater pattern is marked as easy so it’s perfect for beginning knitters. Even if you’ve only done a project or two, this one should be a cinch. I love the heavy yarn and the overall look of comfy with this one. You’ll need to know your purl stitch, which is really easy. This is the perfect cozy sweater for those cold nights we still have ahead of us. Or, start making several now and use them as Christmas gifts! I love short sleeved cardigans. They’re perfect for adding a bit of extra pizzazz to your outfits and particularly great for warmer days. 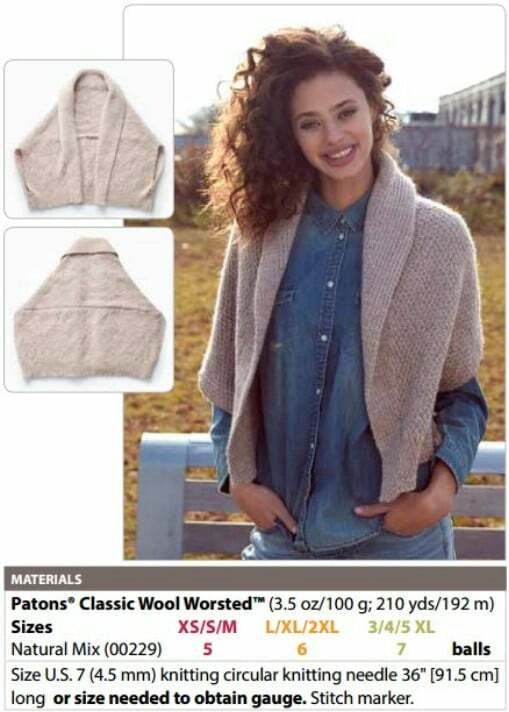 This knit envelope cardigan has a shawl collar and uses a textured stitch. The pattern says intermediate but as long as you know basic knitting stitches this one should be relatively easy. It’s a lovely sweater that will look great with anything you want to pair it with. This lightweight tunic is perfect for spring and summer. The fit is perfect for any shape and size and the pattern can easily be adjusted as needed. You could pair this with jeans or shorts or even use it at the beach as a swimsuit coverup. You just need to know basic crochet stitches to create it and it looks like a really easy sweater to complete. It shouldn’t take more than an hour or so. This is a beautiful cardigan that is really easy to make and so unique in its shape and form. You will need to know the garter stitch for this one. If you come across a stitch you aren’t quite sure about, you can find many wonderful tutorials online. This one doesn’t require any fancy stitches though and can be completed in just a couple of hours. It’s a great lightweight cardigan too so it’s perfect for cooler spring evenings. This crew neck sweater pattern features some wonderful detailing on the front shoulder area and you can easily crochet it in an hour or so. The pattern is actually adjusted for men or women so you could make matching sweaters! You just need basic crochet stitch knowledge for this one. It makes a wonderful three-quarter length sleeve sweater that is lightweight so it’s a great addition to your spring and summer wardrobe. This basic pullover is an easy project for moderate knitters. The pattern is really easy to read and the sweater itself is not at all difficult. It has wonderful detailing on the front and on the sleeves and is a heavier sweater so it’s great for those winter days and nights. The sweater is worked in four pieces; the front, back and both sleeves. This little sweater can be worked up in a jiffy and it’s a great cardigan type sweater for warmer temperatures. You knit each row until the sweater is as long as you want it and then work in the stockinette stitch to make the nice rolled edge. It has a couple of buttons at the top but to the side, which gives it a really unique look. This is definitely a sweater that you can finish by spring! This gorgeous tunic is perfect for parties or just hanging out with friends. The sparkle is a wonderful addition. 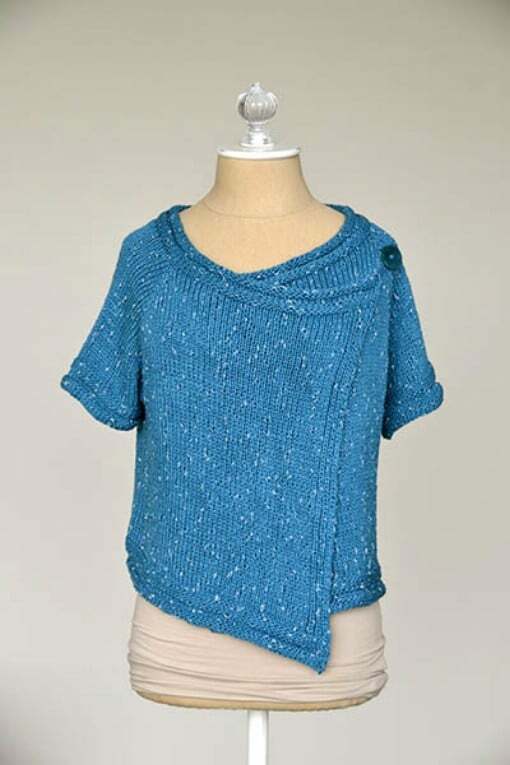 This one has a really unique stitch pattern and uses yarn that has oval sequins, which gives the tunic its glitter. It’s a relatively easy pattern though, despite the elegance of the tunic, and is perfect for pairing with skirts or jeans. What a gorgeous sweater! This crocheted masterpiece features a large flower right in the center. It’s a combination of regular crochet stitches and a half hairpin lace. It’s an easy project and one that you are going to love wearing when you’re finished. It’s also a lightweight sweater so it’s great for summer parties and outings. It would also make a wonderful gift for anyone you know who loves flower power. I love granny squares. Actually I love shrugs too so this one may be my favorite. This one features beautiful detailing and is perfect for the intermediate crocheter. You can do this one if you’re a beginner too. It may just take a while longer. Overall, you should be able to finish it in just a few hours and it’s the perfect sweater to take along on summer nights when the air may be just a bit cool. I really love this Jong sweater. It’s a one size fits all and creates a bulky and oversized comfy jacket style sweater using a garter stitch. The sweater gets its uniqueness from the faux seams. Overall, it’s a simple style and a simple sweater to make. The sweater is three quarter length but you can easily shorten it or lengthen it as you wish. You can also turn back the sleeves for a cropped look. This is pretty easy to knit and you can probably finish it up in under a weekend – and that’s accounting for other activities, too. I really like the look of this coat style sweater. It looks like a pea coat, which are really popular right now and the crocheting is relatively easy. 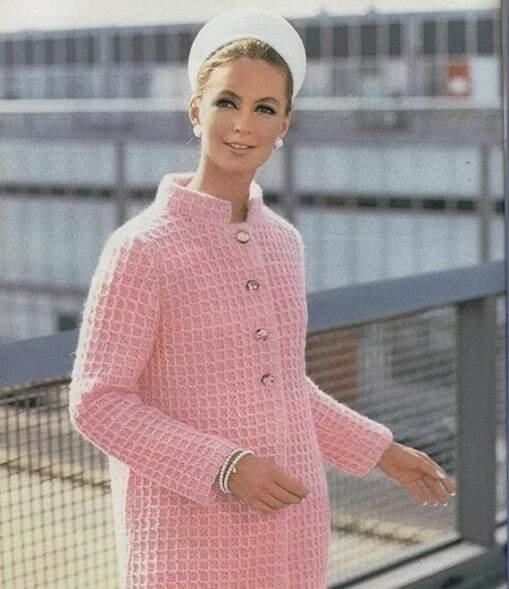 Note, this is a vintage pattern from the 1960s which just gives it that much more appeal. I love the look of this and how easy it is to finish. You’ll need a few hours with this one as it’s pretty detailed but it’s very well worth the extra time. I adore this tank top. The basic shell stitching is beautiful and this is such an easy to finish project. This is the perfect crochet project for beginners so if this is your first sweater or even your very first crochet project ever, you can easily do this one and have it finished pretty quickly. 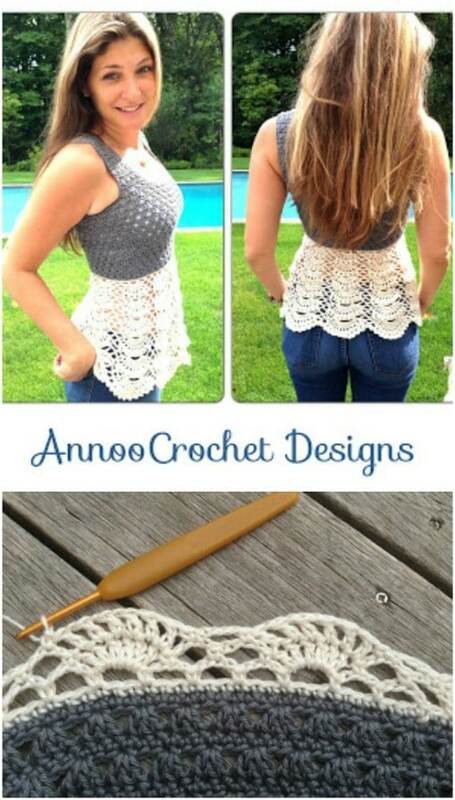 It’s the perfect crochet top for summer and since it’s so easy to make, you could do several of these in different colors and have something for practically every day. This tunic is flowing and gorgeous and really easy to crochet, even for beginners. It’s work in rounds from the lower edge to the bust and then the bust I worked in rounds as well. The back and front of the sweater are worked separately in rows. Overall, it’s a gorgeous and really simple crocheting project and since it’s lightweight, it’s great for warmer weather. I love the fall colors in this one but you could use whatever colors you prefer. 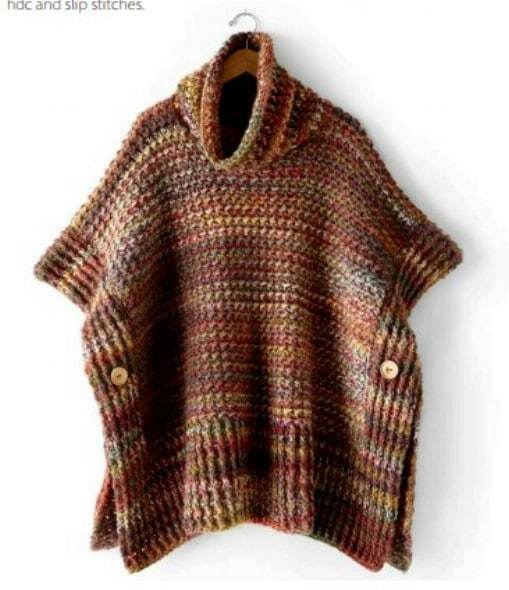 It would be beautiful in Christmas colors and the poncho design is perfect for winter outings. The shawl collar is great and it’s really an easy pattern to follow. The design makes it a simple and really fast crochet. You should be able to finish this one in just a couple of hours so you have plenty of time to make it before fall. This is the perfect knit sweater for your first sweater project. 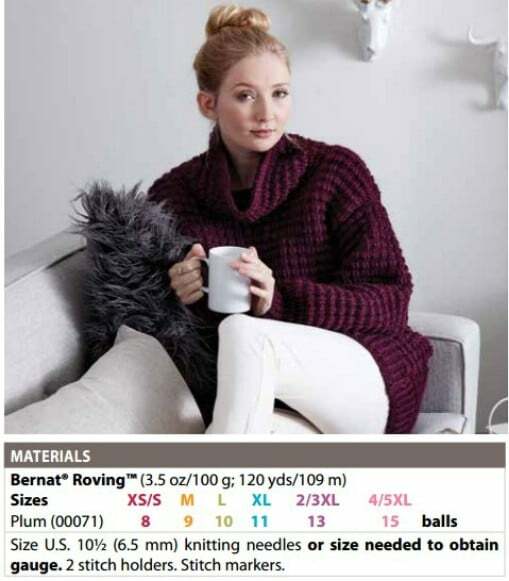 It’s one of the easiest knitting projects on this list and makes a really gorgeous sweater. You don’t need to know any fancy knitting stitches or anything. The pattern is for small but you can easily adjust it to whatever size you need. This is definitely one that you’ll want to make for fall or you could use a heavier yarn for a warmer sweater for winter. It’s such an easy sweater to knit that you may just want to make one for fall and one for winter. Ewwwww! Take us back to the 70’s!!! Sorry, didn’t like those styles then and I still don’t. You had a few that offered possibilities but not much else. I really like the talca tunic but I dont want a garment that hugs around the hips I want just a bit ofmovement/ swing at the hem. Is there a way to do that?